Bharat Arora dida degree in Hotel Management from IHM, Gurdaspur. He was trained at the Oberoi Hotel Cecil, Shimla as a bartender for 3 years. He has also worked at the Westin Sohna Resort & Spa and in Maldives as a Restaurant Manager for some time. After moving back to India, he started working at the Dewa Retreat as a Hotel Manager. 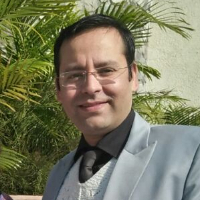 Currently, he is working at the Holy River Hotel in Rishikesh as a General Manager. Hotel Management includes managing the operation of a hotel, motel, resort, or other lodging-related establishment. Management of a hotel operation includes management of hotel staff, business management, upkeep and sanitary standards of hotel facilities, guest satisfaction and customer service, marketing management, sales management, revenue management, financial accounting, purchasing, and other functions. "I did a degree in Hotel Management from IHM, Gurdaspur followed by a training programme at the Oberoi Hotel Cecil in Shimla as a bartender. I then moved to the Westin Sohna Resort & Spa where I worked as a Pool Bar Attendant. Then, I moved to Maldives where I managed the operations of six restaurants. After returning to India, I worked as a Hotel Manager at the Dewa Retreat. I am currently working as a General Manager at Holy River Hotel in Rishikesh."